Android App Package Name Checker, It will show all Installed App'sPackage name and Version Code with some option which allow to CopyPackage Name and Allow to Generate direct PlayStore URL/Link andSharing Package name option.It is really very easy to know thefinal Play Store URL before publish your App, So that you can putthe full URL in your Sharing Option of your APP. ୧ - ‘କାଳିଆ’ଯୋଜନା କଣ? ୨ - ‘କାଳିଆ’ ଯୋଜନାରେ କେଉଁ ମାନେ ସହାୟତାପାଇପାରିବେ?୩ - କ୍ଷୁଦ୍ର ଓ ନାମମାତ୍ର ଚାଷୀ କାହାକୁ କୁହାଯାଏ? ୪ - କାଳିଆଯୋଜନାରେଚାଷୀମାନଙ୍କ ଚାଷକାର୍ଯ୍ୟ ପାଇଁ କଣ ସୁବିଧା ଅଛି? ୫ - ଜଣେ ଭୂମିହୀନଚାଷୀପରିବାର ପାଇଁ ଏହି ଯୋଜନାରେ କିଛି ସୁବିଧା ଅଛି କି? ୬- ଚାଷକାର୍ଯ୍ୟକରିବାକୁଅସମର୍ଥ କୃଷିପରିବାର ନିମନ୍ତେ ଏହି ଯୋଜନାରେ କୌଣସି ସୁବିଧାରବ୍ୟବସ୍ଥା ଅଛି କି?୭ - ଚାଷୀ ଏବଂ ଭୂମିହୀନ କୃଷି ଶ୍ରମିକ ମାନଙ୍କ ପାଇଁ ଜୀବନବୀମା ସହାୟତା ଅଛିକି? ୮- କାଳିଆ ଯୋଜନାରେ ଫସଲ ଋଣ ବିନାସୁଧରେ ଦେବାରବ୍ୟବସ୍ଥା ଅଛି କି? ୯-କାଳିଆ ଯୋଜନାରେ କେଉଁ ସହାୟତା କେଉଁ ବର୍ଗର ଚାଷୀପାଇବେ? ୧୦ - କୃଷି ପରିବାରକହିଲେ କଣବୁଝାଏ? Financing agriculture and insuring the cultivators is essential toeradicate poverty and to boost shared prosperity of the state.Through the implementation of Krushak Assistance for Livelihood andIncome Augmentation - KALIA Scheme , the State Government aims tolend farmers with an all inclusive and flexible support system,ensuring accelerated agricultural prosperity. At the heart of aprogressive scheme like KALIA lies the motivation to empower thefarmers of the state with finance options that will enable thegrowth and development of agriculture in Odisha. Enhancement of theaccessibility to suitable financial services will further ensureagricultural productivity and increase income among farmers ,particularly the small and marginal land holders. Amounting to over10,000 crore the scheme has been tailored to relieve the debtridden farmers from the debt trap, keeping a pragmatic vision todirectly attack poverty by providing financial assistance to thevulnerable agriculture households, landless labourers as well asmarginal cultivators of the state. Proposed by the Government ofOdisha , KALIA scheme brings under its umbrella 92% of cultivatorsof the state and almost all needy landless cultivators , who canavail the benefits of this scheme through Direct Benefit TransferMode. QUALITY FEATURE OF THIS APP-------------------------------------------------------- # Great UI(User Interface). # Fast loading time and high performance. #Extremely helpful customer support. # Adapts to a user's needs. #Compatible with a mobile platform. We are not the owner of thedatas shown in this app.All credit goes to Govt. Odisha. Digital Land Record and Bhulekh Online for all states in one AppAll states Key Coverage- Bhulekh UP up bhulekh भूलेख MP Bhulekhbhulekh mp Land Record Madhya Pradesh भूलेख उत्तर प्रदेश bhulekhori nic Bhulekh Jharkhand Chhattisgarh Bhulekh Bhulekh chhattisgarhbor nic satyapan certi corr search Bhulekh Odisha orisa bhulekhodisha bhulekh bhulekh orisa Opepa Haryana jamabandi Bhulekhharyana Haryana Bhulekh Jamabandi online Bhulekh Kerala, keralabhulekh Bhulekh Andhra Pradesh AP bhulekh Bhulekh Telangana BhulekhBihar Bhulekh West Bengal Bhulekh Uttarakhand Uttarakhand bhulekhBhulekh Tamil Nadu Land Records Punjab Punjab bhulekh, bhulekhpunjab bhulekh chhattisgarh Chhattisgarh bhulekh Himachal bhulekhBhulekh himachal Himanchal bhulekh Tripura bhulekh Bhulekh tripuraGoa bhulekh खसरा विवरण ऑनलाइन खोजें Bhulekh Karnataka BhulekhMaharashtra ShivShaktiTechnology shivashaktitechnologyShivShaktiTechnologyPruductivity ShivShaktiTechnologyGovernmentBhulekh Bhulekh online Online bhulekh Khasra khatauni online Landrecords of all states भूलेख ऑनलाइन खसरा खतौनी This app is free andhas it all so Start Downloading..! KALIA Yojana beneficiary New list released 1. What is KALIA Scheme?2. 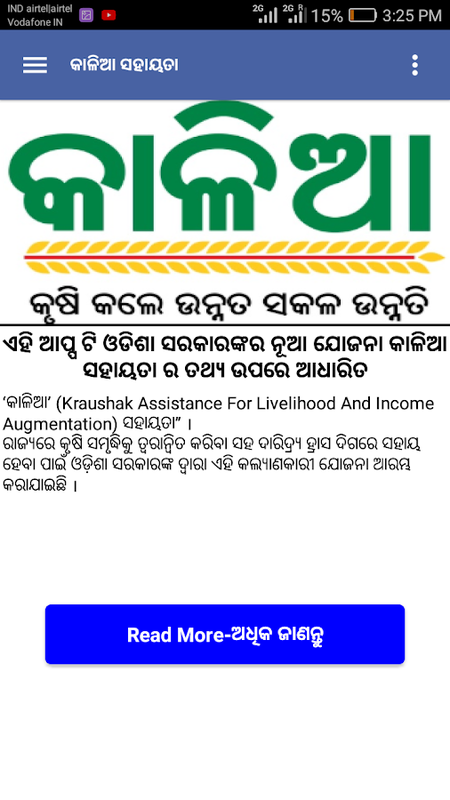 Who is eligible to get benefit under KALIA Scheme? 3. Who is asmall and marginal farmer? 4. What are the benefits available tocultivators for cultivation under KALIA scheme? 5. Is there anybenefit for landless agricultural household? 6. Is there any scopefor financial assistance to vulnerable agricultural household? 7.Is there any life insurance support to cultivators and landlessagricultural laborers? 8. Is there any provision for providinginterest free crop loan to farmers under KALIA scheme? 9. Who iseligible to get the benefits under KALIA Scheme? 10. What is a FarmFamily? 11. Whether an employee of the Government/PSU is eligibleto get the benefit under the scheme? 12. Is an income tax payeefarmer or his/her spouse is eligible to get benefit under thescheme? 13. How a small and marginal farmer (Cultivator) knows thathis/her name is included in the list of beneficiaries? 14. What isthe remedy available for eligible beneficiary if his/her name isnot included in the draft list? 15. What steps an employee of theGovt./PSU and Income Tax Payee farmer or his/her spouse need totake for exclusion of his /her name from the draft list ? 16.Whether a small/marginal farmer during cultivation in Rabi-2018-19is eligible to get the benefit under this scheme. 17. How thebenefit under support to cultivation for cultivation will bereleased? 18. How will farmers get information and for registeringgrievance about KALIA scheme? Is there any HELPLINE for the farmersto know about KALIA scheme? 19. What is KALIA BARTA? 20. Whether afarmer can get information through WhatsApp? 21. Are there anyspecial camps organized for creating awareness about KALIA scheme? KNews Odisha (www.knewsodisha.com) is the fastest growing webportal in the state and is an initiative by the Kalinga Media andEntertainment Pvt Ltd (KMEPL) divison. The app is onestopdestination to all sorts of news, starting from Regional toInternational. With an intention to bring the latest happeningsacross the globe to readers in realtime, the dedicated team ofKNewsOdisha works day and night. We carry our motto with thetagline "Always Everywhere News at Hand (Sabuthi SabubeleHatamuthare Khabar). This is enough to make us feel the jeal we getin serving news to our readers. Download our app today to get thebest and most realtime news, both in and outside the state. We arethere and always will be to bring you unbiased coverage. In this App students can be downloaded:- - All the updatedtextbooks from Class-I to Class-X - Diploma in Elementary education(D.El.Ed) Books D.El.Ed Books are here:- Group A : FoundationCourses (FC) FC1 – Contemporary Issues in Elementary Education(Diploma in Elementary Education) FC2 – Understanding the learnerFC3 – Curriculum Planning (Diploma in Elementary Education) FC4 –Pedagogic Process in Elementary Education (Diploma in ElementaryEducation) FC5 – Education for Holistic development (Diploma inElementary Education) Group B : Pedagogy Courses (PC) PC1-Content-based Pedagogy in Odia (Diploma in Elementary Education)PC2- Content-based Pedagogy in English (Diploma in ElementaryEducation) PC3- Content-based Pedagogy in Mathematics (Diploma inElementary Education) PC4- Content-based Pedagogy in Science(Diploma in Elementary Education) PC5- Content-based Pedagogy inSocial Science (Diploma in Elementary Education) PC6 (a) -Content-based Pedagogy in Hindi (Diploma in Elementary Education)PC6 (b) - Content-based Pedagogy in Sanskrit (Diploma in ElementaryEducation) Note: Please update App tme to time for moreinformation. Odisha Civil Services Examination (OCSE) Odhisha Public ServiceCommission (OPSC) Exam preparation application for OPSC - selectionof civil servants in Odisha Government jobs. Totally more than10,000 questions, properly categorized in multiple sections ! -Coverage of questions covering wide variety of subjects - Focusingon India, World events, Science, Day-to-day GK all for competitiveexams & general awareness. - Fast UI, Best in classuser-interface presented in Android app Quiz format - App designedto work for all screens - Phones & Tablets - Review youranswers against right answers - Learn fast - Detail reports on yourperformance of all quiz attended - No limits on quiz, retry anynumber of times Subjects covered: - General knowledge - AwarenessIncluding, Sports, Places, Events - Indian Polity (Politicalsystem) - Indian Economics & commerce - Indian Freedom movement- Indian History - Indian Geography Science subjects includePhysics, Chemistry, Botany, Zoology We hope, this app shall benefitindividuals to assess yourselves as well for exam-preparations. Weguarantee SUCCESS if you could practice all question-answers givenin this app ..! !